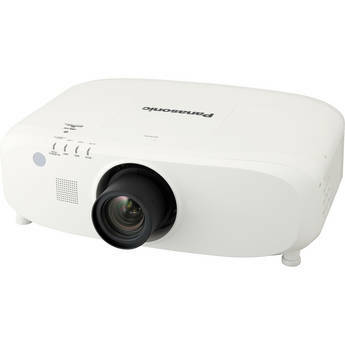 The PT-EX800ZU XGA LCD Projector from Panasonic features XGA 1024 x 768 resolution. It produces a brightness up to 7500 lumens and the iris automatically adjusts to match the situation, which results in a 5000:1 contrast ratio. The projector features three transparent LCD panels (R/G/B) and a widescreen 4:3 aspect ratio. It's designed to afford multiple uses and solutions for the classroom and the boardroom. The PT-EX800ZU features a low-maintenance, dust-resistant cabinet design and a washable Eco Filter that requires replacement after about 15,000 hours. The projector's lamp life cycle can last up to 4500 hours in Eco Mode, and with the lamp set to Auto; the lamp control system automatically adjusts light according to brightness of the projected image. Other features include a 10W integrated speakers, a 29 dB noise level in Eco Mode, Side-by-Side projection and Picture-in-Picture projection. All of the various low-maintenance features result in a low total cost of ownership. The filter is easily replaced from the side and the lamp from the top.